Introduction to Atomized Assembly A major theme within investigating methods of assembly has to do with the relationship between the individual and the “whole” created when individual pieces come together in assembly. This concept is very flexible and can weave through theory and practice very easily. Typically, the singular entity is contrasted to an idea of many, one verses many “ones” This type of difference is based on a numeral difference between the two measurable quantities. The first method of assembly replaces the mason for a deplorable, cnc robot to perform brick wall assembly on site. 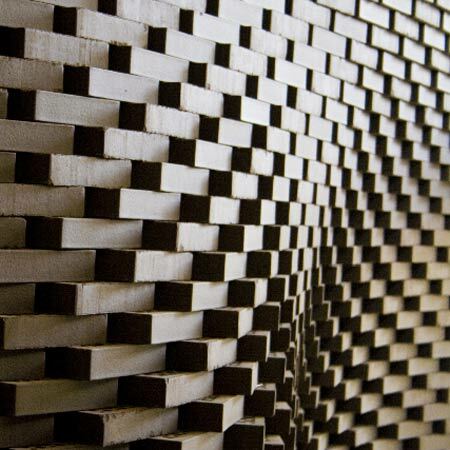 Similar to the drawing machine of Tim and Nick, the introduction of algorimic programming opens up a whole world of possibilities within a tradition that regulated itself to a very controlled and limited set of different types a brick wall is constructed. To a degree, the brick has always dictated its assembled form, it's about listening to what the material wants to be. With technology and better listening through high-tech studies material is being taken to its physical limits to expose what is really possible from such a simple brick. At a certain point the closed idea of many “pieces” (traditional methods of assembly - quantity based) open up to a plane of infinity in which we recognize the vast, ever expanding “many” to be a singular infinity. Commonly, this is when something is recognized as a whole rather than the individual pieces, although this often requires complete assembly. Inversely, this logic creates a situation where the singular piece is, even before assembly having taken place, an assembled whole as it holds within it the instructions for assembly. In the case of the robotic mason this singular piece is held within the algorithm and the brick. In this situation the instruction set for assembly is still separate from the thing that is actually being constructed. While impressive, from a diagrammatic perspective, there are still two elements (brick and the cnc instructions) that are only slightly shifted beyond a traditional, quantity based process of assembly. The quantities still exist within the computer and they are finite and defined before construction starts. What if elements within a traditional method of assembly began to re comprise defined roles within each piece?